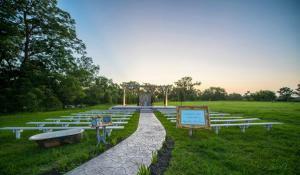 Houston has plenty of wedding venue options to suit every taste, from beautiful outdoor wedding venues to unique sites that can serve as the perfect backdrop to your big day. But in a city so big, there are always new venues to uncover. We’ve rounded up five cool venues, some of them relatively new, that will make a statement on your wedding day. 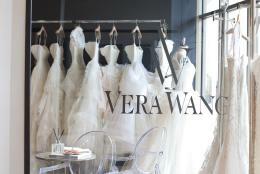 Want your wedding to reflect your love for art? Look no further than Gremillion & Co. art gallery in West University. 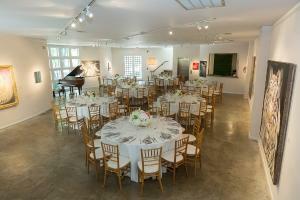 The gallery has two buildings that house beautiful contemporary art and can also host your wedding ceremony and reception. Its main building is an intimate space for smaller events or your ceremony, while the 6,000-square-foot annex features two stories and an adjoining sculpture garden that can accommodate up to 200 guests. Not only is the space unique for its art collection, it’s also centrally located and close to many Houston attractions. Set inside Buffalo Bayou Park, The Dunlavy is a dreamy, glass-enclosed space overlooking the banks of the bayou and Lost Lake. 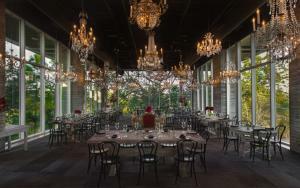 The beautiful, contemporary dining space can accommodate up to 200 guests in a cocktail-style reception or 110 seated with room for more in the outdoor patio. Keep in mind that having a dance floor and DJ will reduce that amount. Catering is provided by Clark Cooper Concepts, which operates The Dunlavy, as well as popular local restaurants such as Saltair, Punk’s and Coppa Osteria. 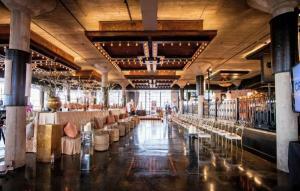 Celebrate tying the knot at this elegant industrial venue with stunning views of the Houston skyline. 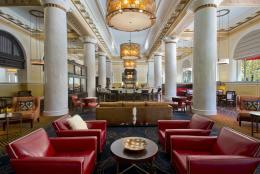 The Heights venue designated as a landmark building by the Houston Historical Society was designed to replicate New York’s Grand Central Station. It’s dotted with gorgeous chandeliers, local art and Art Deco detailing that make for a glamorous backdrop to your wedding. With 14,000 square feet and two levels, The Astorian can accommodate close to 500 guests. If glamour is what you’re after, this is your spot. Not technically in Houston, this new “shabby chic” venue west of Katy has an unbeatable waterfront view and lots of perks for couples. Sitting on 32 acres, the property has a beautiful outdoor space to host ceremonies, a fire pit, gazebo and swings, as well as an indoor ballroom overlooking a creek that can accommodate up to 200 guests. 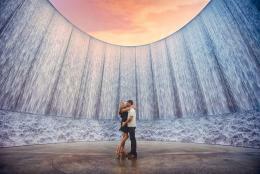 Couples who book the space pay a flat fee and can use the venue for the entire day. Catering is provided by Café Natalie. Beer enthusiasts, take note. 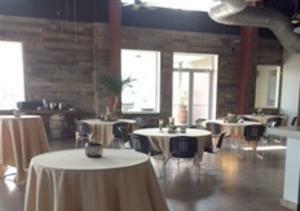 Karbach Brewing Co.’s newish facility has two event spaces that can accommodate rehearsal dinners and weddings of up to 200 guests. You can only serve Karbach beer at your reception but that’s to be expected, and the folks at the brewery will make sure your drinks are extra special. Aside from serving their brews, they can create specialty cocktails like micheladas, shandies and “beermosas” for your guests. They’ll also provide complimentary brewery tours and will take care of all your food. If you’ve been there already you know your guests will be in for a good time.